I bought my Apple Watch Series 4 when Apple announced it this summer, an upgrade from my Series 2. I was attracted by the fall detection (I’m an award-winning accident prone fellow) and also by the new ECG feature. I have a family history of atrial fibrillation, and I’m now 40, so some precautions seemed wise. This afternoon, I was helping a client move offices, mostly just deconstructing a simple network rack and moving access points into new space. I was doing some physical work, but nothing anyone would mistake for exercise. But, then I felt it. My heart was pounding. I got dizzy. Tunnel vision. I had to sit down. I took my heart rate on the watch and it was over 200. I spent five years as a competitive swimmer, and to my knowledge I never got above 195. Even riding up Box Hill on Zwift didn’t get me over 170 this winter. 200 is scary territory. I remembered the ECG functionality, and googled how it worked. I took a reading. I didn’t know how to read it, and I knew I was in a bit of trouble, so I had a coworker take me up to MedStar Washington Hospital Center, a mile or two away. Triage saw me rapidly, and I unlocked my phone to show the nurse. She was setting up a more complicated EKG, but because my heart rate had dropped back toward normal, it might not have any clear result they could read beyond just normal operation. Both the attending and her supervisor wanted a look before the day was done, and I was sent home with instructions to go see my doctor (don’t worry, I’m going on Thursday), but now I’ve got something to show my medical team, as well. Sure, a lot of the time it feels like we live in a dystopian version of the future, and I’m still not sure where the flying cars are, but today I used my wrist computer — list price $399 — to take an ECG before arriving at the emergency room, where a doctor, appearing in my room via video conference, was able to read that medical diagnostic and make a snap judgment that I was probably going to be alright for now. Apple remains a company that exists five to ten years into the future, building bridges back to the present. Touch ID and Face ID. Secure Enclave. Device Enrollment Program. 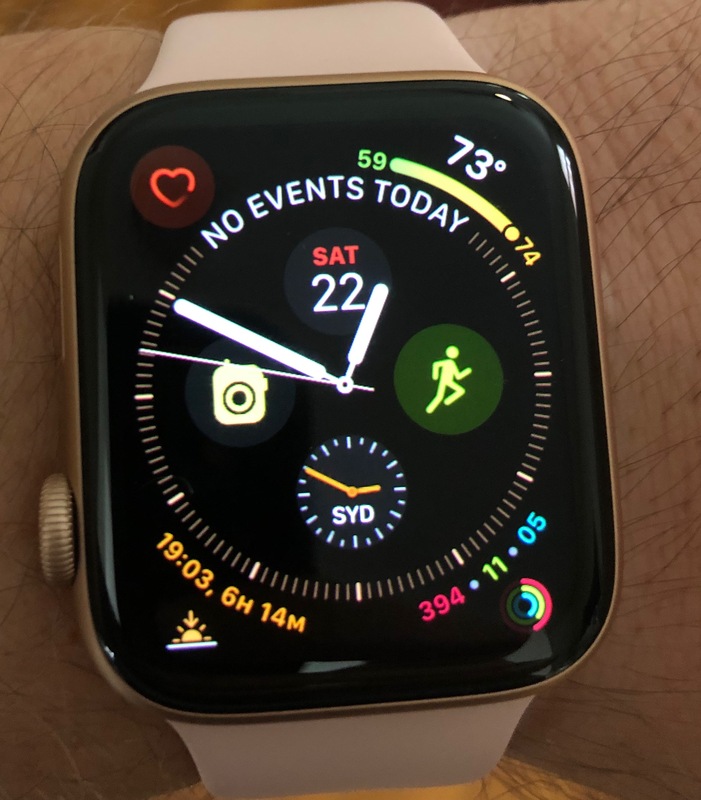 Apple Watch Series 4 Health Tools. Perfect? No. Better than the rest? By miles and miles. Thanks, Apple. My heart is in your hands, it seems. Immediately, we sprang into action. We’re big fans of SimpleMDM and Watchman Monitoring, and both of those tools came in handy. The first thing we did was check the logs from Watchman Monitoring’s client agent on the machine to see if it had checked in over the weekend. One of the machines had checked in on Sunday! We set both to alert us if they checked in again, and logged into SimpleMDM to see if the device was checking in there, as well. We could see the one device, which gave us a couple different options: We could lock or wipe the machine and hope that it wouldn’t just end up in a landfill, or we could try to get the machine back by giving some data to the police. I know from experience that just giving them an IP Address isn’t likely to get a good result, so we started to think what else we could we do to get the machine back? What if we could give them a location, and more information? This post isn’t here to get you to buy Prey, but it’s to tell you how we got Prey installed when we didn’t have the machine in our full control. By default, Prey requires an API key to register new machines, and their method is just “Hey! Install that at the Command Line by SSH’ing into the machine!” Which, okay, fine, that might work if you can get that far, but how’s about we do something a little bit different? To build this package, we used Packages from WhiteBox. I created a new project, gave it a name (Black Widow), Included our Prey installer package to a known directory, and then add a Post Install script to invoke it using our API Key. This gave me a functioning package that installed Prey and keyed it to our instance, which was great! But, how do I get it onto the stolen machine? The machine’s location and positioning information, as well as some additional detail, gave the police something to use to be a little more active on the case. We’re now waiting to hear if they’ll be able to repatriate the laptop to its owner.